Hitchcock made great thrillers and good dramas. This was (mostly) the latter. My only disappointment is that the beginning is the perfect setup for a thriller! It is classic Hitchcock, from his early cameo to the tongue-in-cheek roadsigns leading us to the dead body. 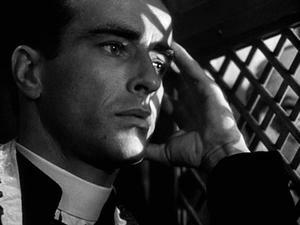 And then he eerily creates the terrible situation for the priest (who was very nicely played by Montgomery Clift in a thoughtful, understated performance that hinted at a little more depth than the material provided). Then the tension built, with a no-way-out scenario, mysterious relationships and point-of-view camera work. I was getting excited for a twist-filled ride. Suddenly, I found myself watching lots of dialogue about an ill-begotten romance and a courtroom drama. Now, I thoroughly appreciate the somewhat successful effort to make the movie a moral tale. And I will say that the way it played out was entertaining. However, after watching the first twenty minutes or so – and all the while conscious of Hitchcock’s presence – I was a little let down. Hitchcock’s genius was in his ability to slowly build tension, either to a real or false climax (which he often used to great effect). Here, the tension builds, places the priest in the worst possible place, and then dawdles. The police seem to be a little slow at putting together clues. The priest’s ex-lover (Anne Baxter, who is fine but melodramatic in that “slow head-turn” early 50’s kind of way) takes on the focus for a significant middle section of the movie, which deflates rather than builds the mystery. Instead, everything we learn from her serves only to give background for the lawyer’s courtroom banter. Yet somehow, at the very end, I felt a definite surge of excitement when the real murderer confesses. Some of it is due to Clift’s sympathetic acting, and a built-in respect for anyone who would take such a beating in the name of their beliefs. So in that sense I Confess works as a moral tale, or a tale of bravery; or perhaps they can easily coincide in the same movie. I certainly liked the movie quite a lot. My hesitations arise only from the confusion of two genres: the murder mystery and the moral courtroom drama. They could certainly have worked as one, but Hitchcock trades off rather than melds them. Not his best work, but still more involving than most movies about murder. This entry was posted on January 31, 2010 by Ian Kay. It was filed under I Confess (1953) .